Valerie, like yourself I love my precious ‘things’ but have become so concerned lately about the amount of stuff we are producing and just throwing away in this world! Perhaps if more people bought beautiful and functional objects they felt a strong connection to,and held onto them for a lifetime, as you have, then the oceans would not be so full our waste.It’s lovely that you are handing your things down – I am sure they will be treasured. Dear Michele, thank you for your understanding comments… I think we think alike on this! Perfect! Good luck in your venture and may it serve to inspire others. Thank you so much… at the moment I’m enjoying your lovely gardening blog…. Hello Kathie, good to hear from you – so we’re in this together!!! Now I needn’t be embarrassed for using the same (favourite) dishes day after day. I think I’ll keep my eye for one of those platters for my roasted veggies – one that’s smaller. Oh-Oh, now I have a 2nd hand worm! It may take years to fulfill. Very progressive idea for the Christmas presents. Besides, there’s such joy in receiving family favourites – especially when they may include homemade goodies! Hello Amy, glad you approve of the Christmas present idea! I’m going to be busy saving over a hot stove before Christmas.. enjoy looking for the perfect platter!!! I know exactly the dish you mean! I bought a whole lot when I lived in Hong Kong over forty years ago. Back then, no-one bought these lovely artisan products, but I thought they were gorgeous…. And Americans were not allowed to buy any China products because of the stand-off between Mao and the US. I kept mine for years and only parted with them when I was trying to give up blue and white, sorry I did now.Those fish were a work of art, and seemed to be hand done, as few of them were exactly the same…. I think most of the nice plates and bowls I have were gifts from others. I have never owned a dinner set or silver set or anything like that and am quite glad not to have to be concerned about the odd breakage. I think crockery, unlike gadgets contain memories and thus handing them down is most appropriate, it’s more than just a functional item you pass on, it’s many happy memories of gatherings I am sure. Oh Valarie. I would feel like royalty at your table, eating off your lovlies. Such a beautiful and sentimental picture you paint. I can relate to the pots and pans.Even though mine are embarassingly ugly, I know what to cook in them. Your answer to holiday consumerism with family gifts ” that they’d enjoy” is the key to that. I have accepted so many “handed down” items from family that I really didn’t want, but couldn’t hurt their feelings that I now call it, handing down ancestral guilt. My grown children and I have this complete understanding now when I offer them something. The recipient has to want it. Love the food for thought. Must try that. Oh Lynne, what a lovely comment… this love for china and connection with pots and pans is such a universal thing for women, it seems. Love your phrase ‘ancestral guilt’ .. my children don’t suffer from it – they say no if they don’t like something! You are so right that every meal, every snack, every drink has its own receptacle, its best receptacle! It’s funny to read this post today as my mother is coming over later to give me some of her household objects she no longer cares to have in her house but still cares for. I will adopt some of them, memories and all, and be the caretaker for now. Love your comments Letizia… yes, it makes such a difference to food the way we serve it, doesn’t it.? I feel the same as you. In fact many of the items you mentioned are also my favourites. A couple of years ago I de-cluttered in a ruthless, heart-breaking way. I now have 1/2 of what I had and double what I need. The things I did keep give me comfort as I now actually use everything! Love it… china, the things we eat on and use seem to mean so much to women, judging by the comments … I gave my blue and white ( not willow pattern but similar) to my daughter, who uses them. They remind her of her childhood when we did use them! I just love dishes. I have too many but also have difficulty parting with any of them. I like to switch it up a bit and they are an easy way to do that. It’s a small joy that doesn’t hurt anyone … doesn’t pollute or waste energy , and just takes up ( a little) space !!!! I have such trouble getting rid of things. So much of my stuff is handed down to me and as I use it or even just look at it upon my shelves I think of those hands that lovingly touched them and the people who lovingly used them and I can’t let myself purge them. I guess my children are going to get the dubious honor. Sharla, what a gorgeous comment – a blog in itself…China really does it to us women doesn’t it? And those beautiful old tins with their lovely labels, so special…. I do not like clutter, it makes me feel scatterbrained, and I often want to purge the things I don’t use. But most of my belongings, especially dinnerware, serving pieces and the odd antique were so lovingly selected that it’s difficult to let them go. 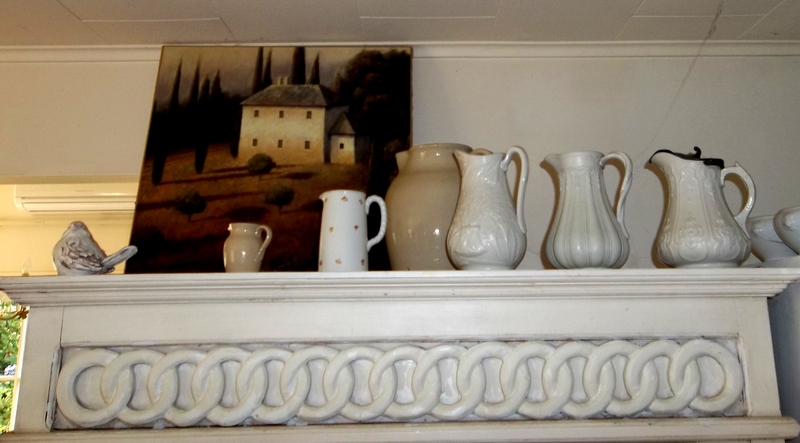 I say embrace the madness, besides you have some beautiful creamware on that shelf! Know what you mean about clutter, but in a small kitchen organised clutter is inevitable! Yes, those things we are love are hard to let go – I love your phrase embrace the madness – Yes !… so pleased you noticed my jugs!!! Thank you – so glad you enjoyed it, and so good to hear from you. I think many women have affairs with dishes. I don’t know anyone can write about “de-clutter” this beautifully. Thank you, Valerie! I love the idea of women having affairs with dishes… you’re so right, and until this post I hadn’t realised how deep and passionate they are !!! What a lovely tour round your kitchen and through your things. I’m really at the other end of the scale. I have a tiny kitchen and Dan and I only have 4 plates. When we have people over for dinner we ask them to bring crockery!! I love your idea of giving people your things as gifts – truly special and personal. Hello Gabriela, I love the idea of bringing your own plate… so no washing up afterwards either! My first plates came from Woolworths, they did a nice line in crude Willow pattern back then when Woollies still existed! Things tend to change when you have children, and suddenly you need a whole lot more of everything!!!! Dee, I loved the picture of you sitting down, and reading and smiling and nodding and agreeing! Delicious !!! Yes, I never mind the extra work , which balances out the extra pleasure! Thank you so much for your lovely comments – they made me smile! The thing is, with the stuff we collect… It’s already been bought. Damage is already done… so we might as well honour its continued existence! Love your idea of recycling for Christmas! Me – I haven’t yet managed to hoard to many kitchen items, on account of always having small, rental kitchens. But I’m terrible at destroying records… My garage is already overflowing with forests worth of paper, and my only consolation is that most of my records now are digital. At least your kitchen items are in use, and aesthetically pleasing! Hello Alarna, Just catching up… my internet was down for a few days, and I’ve been in a muddle with everything piling up on me! Yes, I know about the records thing…which is why I find it so hard to use the delete button!!! What a thoughtful piece, Valerie. So happy to have discovered your writing, by way of Elisa. A little over a year ago, my husband and I left our home in Germany to embark on an international sabbatical. While living on the road throughout Southeast Asia, with only two suitcases of ‘stuff’, we discovered how freeing it was to live more simply. The objects hold memories, of course, but we learned that we don’t really need them. Tricia, thank you so much for your comments, glad you like the blog…I’m looking forward to exploring yours. Yes, you’re right, possessions weigh you down.. but as soon as you have children you seem to need more possessions! Glad you feel safe enough and confident enough to start enjoying yours again. I think your idea of a china library is brilliant! I’d be there like a shot… I think they’d have to devise special containers so we weren’t always wrapping and unwrapping to avoid chips in transit!!!! Hope you catch up on your sleep!!!! Do you know what stops me from desiring to acculmulate too much stuff? Going to vintage and antique stores. You’ll see various people’s lifelong accumulations of “things” for sale and it is always vaguely depressing. Is that where stuff ends up? So other people can acquire it on the cheap, and start their own accumulations? Of course, I can’t resist EVERYTHING!